Author Arthur Ransome (1884-1967) set his Swallows and Amazons series of children's books in the vicinity of Coniston Water (the 1967 film was made at Bankground). His childhood summer holidays were spent at Cartmel, Cartmel Fell, and High Nibthwaite on the shores of Coniston Water, where he sailed, swam, and fished. Here is Wildcat Island and the promontory of the first Swallows expedition. Ransome was born in Leeds. He attended school in Windermere, and, after graduation, moved to London to work. 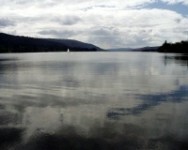 He continued to spend holidays in the Lake District as a young adult, staying with his friends, the Collingwood family. W. G. Collingwood was an artist and writer and taught Ransome to sail on his boat, the Swallow. Ransome visited many places in the Lake District. Graythwaite Hall Gardens was on his itinerary as was the Red Lion at Lowick, which he mentions in his autobiography: “...drank our second pint in the Red Lion at Lowick Bridge.” He spent part of his adult life at Lowick Hall. He visited the Drunken Duck pub in Ambleside and stayed at Wall Nook farmhouse in Cartmel. He married an English woman but then left her and went to Russia in 1913 as a newspaper correspondent. Here he met his mistress, a former secretary of Trotsky. After World War I, they moved to Estonia, and Ransome sailed his boat Racundra on the Baltic. The couple returned to the Lake District in 1924 and married. 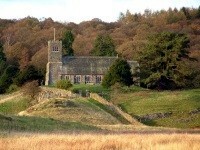 They lived for ten years at Low Ludderburn in the Cartmel Fell valley where Ransome worked on his Swallows and Amazons series from 1930 to 1934. Some of the book titles are Pigeon Post, Winter Holiday, and Great Northern. Ludderburn was Ransome's favourite home because of its panoramic views of the Lake mountains and Yorkshire. Ransome also lived for a while at Pin Mill in Suffolk and visited the Norfolk Broads, the settings for his stories, The Big Six and We DidnÃƒÂ¢Ã¢â€šÂ¬Ã¢â€žÂ¢t Mean to Go to Sea. He made one trip out of the country to China as a newspaper correspondent after settling in the Lake District. His last dwelling place was a house, Hill Top (no relation to Beatrix Potter's home) at Haverthwaite. He is buried at St Paul's Church in Rusland. A section of the Museum of Lakeland Life contains a reconstruction of Ransome's writing room with his desk, drawings, and memorabilia. The Windermere Steamboat Museum houses a Swallows and Amazons exhibition and the boat, ‘Esperance’, that served as the model for Captain Flint's houseboat in the book. High Nibthwaite is on a minor road off the A5084 by Coniston Water. At Abbot Hall, Kendal on the A6. Open daily from 10.30-4pm, until 5pm from April-Oct., 21 Dec. closed Christmas weekthrough Jan. Located on Rayrigg Road, Windermere on the A59.